Several years ago my wife Paula and I had the pleasure of coming across one of Warren's sculptures in Santa Fe, NM. "Window Rock With Ring" was hiding in a corner and immediately caught Paula's attention and ended up in our home in Aurora, CO as a center piece of our main living area. The piece, like many of Warren's sculptural pieces, has an earthy tone with a modern twist that seems to make a wonderful transition between nature and our built space. On a whim I dropped Warren a phone call just to say thank you for WIndow Rock With Ring. After leaving a message I felt that was likely the end of it and presumed he was busy with other things. To be candid I and was quite honestly a bit surprised when he called back as it's been my experience many artists just let those sorts of things pass. However what I had expected would be just a few moments of chatting turned into a lengthy and candid conversation about not just his piece but the entire experience of purchasing it and about larger scale design in general. Clearly this was a guy who just loved what does and loved to interact with his clients. With that piece safely in hand we had the pleasure of meeting Warren at "Art in the Park" festival in Loveland, CO. His energy and passion was clearly evident as was his creativity when we began discussions about an idea for a water feature based on a similar concept to Window Rock With Ring. 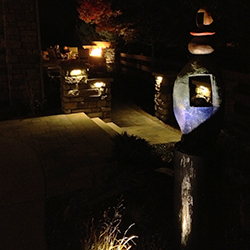 A few years later we had the perfect project for our new home and the process of collaboration with Warren on a Window Rock Water Feature began -- and eventually became a reality. The entire collaboration process was a pleasure, with a free flow of sketches, photos, ideas, and concepts that eventually lead to a finished product that has gathered the attention and comments of most everyone who passes by our home. It's certainly a process that we'd recommend to anyone considering a commissioned piece. Over the past several years, and 3 wonderful sculptural pieces (2 inside, 1 outside) we have fostered a relationship that is creative, personal, and professional, and we encourage anyone considering a commission or purchasing a piece to do so without hesitation! The reward will be well worth such a pleasant journey. warren is a good guy, and interesting personality and enjoys people and his passion creating art.